Today, unless you are adventurous enough to sail down the Nile by felucca, your journey will be in one of the 200 or so river boats that act like floating hotels between Luxor and Aswan. Hemmed in by the barrages and the ‘British’ dam at Aswan, they move up and down between the two all year long. They glory in great classical names like Rameses, King of the River, or Nefertiti, King Tut, Ra even, or have names which compete for today’s dreams like Moon River or Nile Splendor (note the US spelling). Our boat was the MV Atlas, one of the smaller, less grandiloquent crafts, but comfy, well run and of a pleasing size. Sadly for the company which owned it (these floating hotels are owned by tourist companies or by the hotel chains who own the land-based hotels too), but pleasantly for us, it was hardly more than half full. When at capacity the Atlas would hold eighty-five passengers and a crew of sixty. These crew members would encompass a manager and two assistant managers (the manager is effectively the captain and chief executive, purser and PR manager rolled into one); a pilot and two assistants, an engineer and five assistants, a maitre d’ and ten stewards, a housekeeper with ten staff, three barmen and nine sailors who doubled as porters, and ten service staff. In addition each tourist language group is accompanied by its own tour guide. At any one time about a fifth of this hierarchy will be on ten days’ leave after six weeks on the river. Many of them are able to visit their homes when the boats dock at Luxor or Aswan, but others come from as far away as Cairo. How do all these people come to their jobs on the boats? For all except the manual workers there are various forms of apprenticeships. Some will have gone to hotel-management school; the guides will have done a university tourist course; the stewards come from long lines of Nubian domestic staff with experience passed down through the families. The pilots learn the river on feluccas and graduate up through work boats to the helm of a floating hotel, learning as they go. There is a lot of camaraderie among the pilots, who wave and shout across to one another from boat to boat as they pass and give blasts of their horns. We joined the helmsman one morning as he zig-zagged along past a village at the bend of the river. Despite his pointing them out to us, we could barely discern the slight ripple that warned of a sandbank below the surface, and guided the assured skill of his actions. Nowadays, since the High Dam, the river at least stays in one place. No longer do unexpected shoals catch unwary boats as they frequently did in the past. At Aswan each company has its own anchorage. 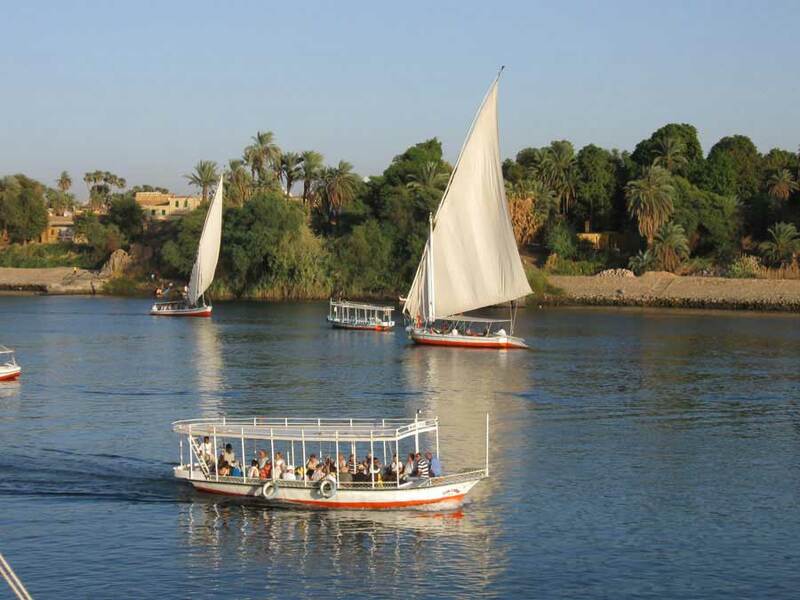 The Nile side is lined by arches on which are listed each company’s boats, with steps dropping down the steep bank to the mooring. In Luxor and along the river it is a free for all, but the Atlas appears to have clout and seniority and often moors beside Luxor temple. The boats may be lined up two or more deep. We briefly were boat eight on the outer edge. All the boats have a wide central reception area, and to reach an outside boat you walk straight through all of them from the shore.